By Łukasz Białek - MD, Mateusz Mucha and James Mathison. How to calculate wind chill? How can we be sure of the result? What can I do to survive? Is super cold weather so bad? The wind chill calculator is able to turn the subjective feeling of wind chill into an objective measurement. Most advanced weather reports now include the real temperature as well as the wind chill temperature. Are you wondering what is wind chill exactly? It is defined as the perceived decrease in temperature due to the flow of air across the skin. But this is not just a feeling! It's a real thing and may have real consequences to your health. Keep on reading if you'd like to know how to calculate wind chill yourself and get to know about the dangers of extremely low temperatures. Conduction: The transfer of energy within a body. Convection: The movement of particles in liquids or gases. Radiation: The transmission of energy through space by a thermal radiation. Your body naturally emits heat all the time, warming up the air around your skin. When convection is very low, i.e. the air is still, this boundary of warmer air stays with you for longer, trapped (for a time) by the hair on your skin. The wind increases convection and blows away this boundary of warmer air, replacing it with fresh, colder air. Then, the skin radiates more heat into the surrounding air, and body heat is conducted to the surface in order to meet this increased need. This is the mechanism of the cooling effects of the wind. The wind chill calculator puts it into a concrete figure, which is extremely useful for practical purposes. v is the wind speed in kilometers per hour. v is the wind speed in miles per hour. Even if those equations seem complicated - don't worry! With our calculator you can estimate wind chill easily, both, in Fahrenheits and miles per hour, or in Celsius and kilometers per hour. It's up to you! Wind speed is measured by using a tool known as an anemometer. Although it looks like a weather vane, it uses four bowl-shaped appendages, tilted to one side, giving it the ability to accurately measure the speed of the wind. This accuracy of this measurement is of course critical to getting a meaningful result from the wind chill calculator. For your own purposes, you can check the speed of wind and air temperature in the weather forecast. It seems strange that a subjective experience, such as how cold a day feels, can be measured quantitatively. However, it's more than just a feeling. The reason a windy day feels colder is because more heat actually is taken away from the body. It seems obvious that the faster the winder and the colder the temperature, the lower wind chill. And the lower the wind chills the higher the risk of health consequences as more heat is drawn from the body, which lowers the skin temperature and, ultimately, the internal body temperature. With the real-life dangers of frostbite and hypothermia it becomes very important to crack the code of wind chill and produce calculations that people can rely on. assumes a clear night sky, i.e., the sun has no impact. 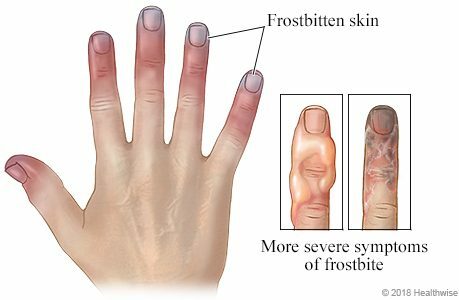 From a medical point of view, frostbite is a direct freezing injury to peripheral tissues that occurs when the skin temperature drops below −0.5°C (31.1°F). It most commonly occurs in cold-exposed areas of the body with less blood flow. Common sites include the nose, ears, fingers, and toes, which are further from the body’s core and more susceptible to vasoconstriction. When the temperature of your skin drops down, you start to feel different sensations. At skin temperature of about 28°C (82.4°F) you feel a sense of skin cooling, pain at approximately 20°C (68°F), and numbness as skin temperatures drop below 10°C (50°F). There are many factors which increase the risk of developing a frostbite while being at a cold temperature. The most important ones include drinking alcohol, smoking, mental health problems, certain medications, and prior injuries due to cold. 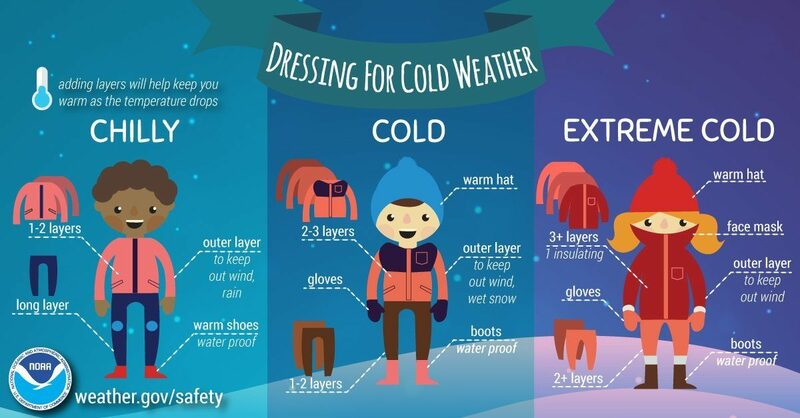 In case you are a witness of frostbite remove your wet clothing and protect the frozen tissue from further injury. Then move as fast as possible to a warm and dry environment. And don't even think about rubbing nor applying snow on the frostbite! 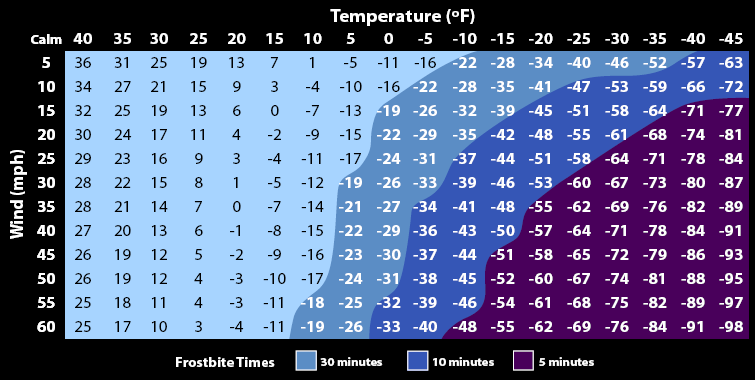 Ideally, frostbite should be treated at a medical clinic with rapid rewarming with a warm-water bath at 37°C to 39°C (98.6°F - 102.2°F). As it is hurtful, you can take some painkillers (e.g. ibuprofen) to relieve pain. If you afraid of operation - don't worry! Performing an immediate surgery is rarely necessary. However, in severe cases, doctors may be forced to amputate frostbite to save a life. This decision should be delayed for even a few months to expose the extent of an injury. Avoid this situation by wearing warm clothes, gloves, and cap. Take care of yourself! Hypothermia is a medical term which is usually defined as a core body temperature below 35°C (95°F). It occurs when your total body heat loss exceeds physiologic heat production. You can feel different symptoms depending on severity of hypothermia. At first notice, it is increased shivering, social withdrawal, and other behavior changes. Moreover, if the core body temperature still lowers, you can experience pupils dilate and cardiac arrhythmias. Then comes the loss of consciousness. In severe hypothermia, with core body temperatures below 28°C (86°F), bradycardia and ventricular fibrillation become very likely, and there is also a loss of voluntary movements and deep tendon reflexes. Despite worsening symptoms with lower core temperatures, the lowest documented survival from accidental hypothermia is 13.7°C! The symptoms of hypothermia vary on the patient, but it's essential to diagnose it as early as possible since it may improve the survival. The most important thing during first aid is to fully rewarm the patient. If you suspect hypothermia, wear warm clothes, blankets and use a hot water bottle first! Then immediately head towards the nearest hospital and let specialists take care on yourself. When the weather outside is super cold, and when it's windy you may start to wonder - what should I do to survive? First of all, don't leave the house unless it's absolutely necessary! If you have to stay outside for as short period as possible. When the winds are stronger, it can whip the heat away from your body quicker, so don't stay outside for a long time. Wear a lot of clothes, a lot of layers. And one more time - layers! Cover all exposed skin, wear a cap, gloves, thick socks, winter boots, scarf. Consider using a face mask to prevent nose and use hand warmers. After reading all that stuff about health consequences of cold, you may start to wonder if there is anything at all not bad about it? Actually, there is! At least for some of us. Due to such frigid wind chills, many schools are closed, so it's a piece of good news for the children! There is also our unique calculator called White Christmas that bases on the historical data to predict the chance of snow on Christmas day in your town. Łukasz Białek - MD, Mateusz Mucha and James Mathison. 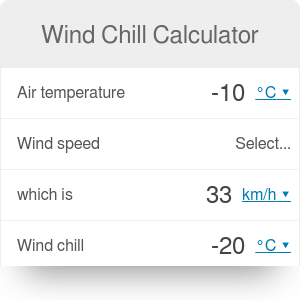 Wind Chill Calculator can be embedded on your website to enrich the content you wrote and make it easier for your visitors to understand your message.